If your pack has not already planned some activities this summer, DO IT NOW! Go fishing or hiking in June, day camps and Resident Camp are in July, and have an ice cream social, family picnic or family camping overnight in August. Remember, you will need to promote and remind parents of your events to make sure they remember to attend! Family Overnight campout at an approved Cub Scout facility. These should have flush toilets for the convenience of younger boys and family members less comfortable with camping. Be sure your destination is approved by calling the Council office and asking if the facilities meet the Guide To Safe Scouting. requirements. Amusement Parks – almost everyone has an amusement or water park someone close. Call the park and ask about discount to groups or scouts. Many have special days with low rates just for scouts and families. Parent-Son baseball game – nothing caps off the baseball season like a parent- son baseball game. You can divide up the teams – with a parent going to one side and the son to other team. This usually keeps things calm for those that are overcompetive. You can play parents against the boys (usually great fun) but adults play opposite handed. They bat and throw with there non-dominant hand. Ok to catch the ball with either hand. If you have a Mom that was a softball champion, you may have her bat opposite handed too. County and state parks often have ample facilities for a pack, a great nature lodge, and fishing. Usually there is a great picnic area. Call your park for information. Derby Days – hold a raingutter regatta, space derby – and second pinewood derby race – for no prizes. Have a Dad’s division so they can build their own car and leave Jr’s alone next year. Minor league Ball games – Most minor league ball teams hold a scout night with a sleepover in the outfield. Check out your local team!! And the cost is usually very reasonable. The Wilmington Blue Rocks are about $6 a ticket. Or if not a sleepover – a fireworks night!! Get together with another pack (or two or three or more) and plan a day of sporting adventures. Solicit ideas for large group games from the participants. Fill in with other games from the How To Book. Suggestions could include - holding races – crab walk, gorilla race, kangaroo race (See Bear book), an inter-pack kickball or volleyball tournament. Ask, too, for individual things boys (and/or siblings) can do – e.g. fishing, physical fitness course (See Wolf book), and/or a specialty hike along a marked trail, disc golf. The CS Academics and Sports Program Guide has a plan for setting up a Pack Sports Event or Tournament and the Special Pack Activities section of the How To Book has ideas for Cub Scout Field Day, Summer Celebration, Welcome to the Midway, and Western Rodeo. All these could be blended into a special program of activities selected just for your group. Maybe you want to teach them how to play Ultimate and hold a game. Or choose another sport. Here is an easy tool for your Cubs to make that will help them keep their knife sharp. Have a July 4th Outdoor Flag Raising Ceremony at your Chartered Organization site or a local school or church. This is a great opportunity for the boys to participate in a flag raising and share some flag protocol. Follow up with a “parade” for kids on bikes, in wagons, on big wheels, etc. It’s even more fun it they are decorated. Have a contest for the best decorated or give everyone a prize for participation. (See ideas for decorating bikes under crafts) If this is a Pack Event, you could have a pancake breakfast following. Raise the flag at a local school for a specific period of time. Play a team sport and then discuss how the whole is greater than the individuals, relating this to society. Re-enact the signing of the Declaration of Independence or some other historic event at a campfire. While on a pack overnighter, boys make up “laws” to govern their “tent city.” Discuss why it’s important to understand how good laws benefit all citizens. Host a Flag Retirement Ceremony - Advertise to collect flags that are dirty or tattered and invite everyone to attend an official retirement ceremony. Pioneer District, Golden Empire Council has even gotten support from a regional grocery, (Raley’s) that prints fliers with instructions on the proper display of flags and collects old flags from their customers. During an entire weekend at the local BSA camp, Camp Pollock, a fire is kept burning from Friday pm thru Sunday and flags are retired by all levels of scouts. There is also a demonstration of lashing skills, living history events such as a visit from “Baden-Powell,” and opportunities to take bike or hike trails and work on badge or belt loop work. Make posters showing the correct way to display the flag – ask local retailers to display them. You might also be able to put a display in your local library or community center – but be sure to put it up and take it down on time! Visit a local fireworks display as a pack. Challenge each family to obtain an American Flag for their home and to fly it on National Holidays for the next year. You might even take a photo of each family in front of their flag for the Pack or Den scrapbook. Of course, many packs will be having a Space Derby this month – have a great race! Build your own rocket using paper and fizzing tablets! Watch it lift off. How high does your rocket go? Print this page for the instructions. Paper, regular 8-1/2- by 11-inch paper, such as computer printer paper or even notebook paper. The film canister MUST be one with a cap that fits INSIDE the rim instead of over the outside of the rim. Sometimes photography shops have extras of these and will be happy to donate some for such a worthy cause. Keep in mind: Just like with real rockets, the less your rocket weighs and the less air resistance (drag) it has, the higher it will go. You must first decide how to cut your paper. You may cut it the short way or the long way to make the body of the rocket. There is no one right way to make a paper rocket. Try a long, skinny rocket or a short, fat rocket. Try a sharp nosecone or a blunt nosecone. Try it with fins or without fins. Cut out all the pieces for your rocket. Wrap and tape a tube of paper around the film canister. Hint: Tape the canister to the end of the paper before you start wrapping. Important! Place the lid end of the canister down. Tape fins to your rocket body, if you want. Roll the circle (with a wedge cut out) into a cone and tape it to the rocket's top. Turn the rocket upside down and remove the canister's lid. Fill the canister one-third full of water. Drop one-half of an effervescing antacid tablet into the canister. Snap the lid on tight. Stand your rocket on a launch platform, such as your sidewalk or driveway. Stand back and wait. Your rocket will blast off! String a pin with 4 red and 4 white beads. Start with white and alternate colors. You will end with a red bead. String 3 more pins the same way. String a pin with four blue beads, then , with a white, red, white and red bead. String three more pins the same way. Use a butter knife or pliers to bend open the non-fastening side of the pin. String the eight pins on this non-fastening side. Put the four red and white pins on first. Then put on the four red, white and blue pins. 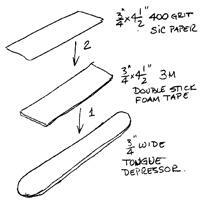 Cut the tongue depressor to about 2½” long. Round the ends so that they match with kitchen shears. Using markers or paint, draw a flag on the tongue depressor. Or get any appropriate stickers or stamps and stick it to the depressor. Glue the PVC pipe to the back for the loop. Make this bang-up slide for Independence Day. Obtain a dowel rod ¾ or 7/8 of an inch in diameter and cut a piece to measure 2¼ inches of length. Prepare to drill three holes with a 1/16-inch drill bit. To make a hole for the fuse, drill the center of the length of the dowel about halfway through. Rotate the dowel one-quarter turn and draw a pencil line across the length of the dowel. To make holes for the back loop, drill two holes along the line a half-inch from each end. Lightly sand all surfaces with medium to medium-fine sandpaper. Smooth the edges of each end until slightly rounded. Paint the dowel red with either spray enamel or enamel model paint. Use several light coats rather than one heavy coat, allowing each coat to dry. For a fuse, cut a piece of candlewick or heavy cord about 1 1/2 inches. Paint the fuse royal blue. After it has dried, glue the fuse into the center hole. For the back loop, use a 2½ inch strand of 12-gauge house wire with plastic coating. Remove 3/8 of an inch of plastic from each end. Bend the ends at right angles so that the middle section matches the distance between the holes. Check to make sure the ends will fit before gluing in place. Add beads on both ends. A new or canceled postage stamp. Cut a piece of thin wood (about 2 inches larger in diameter than the stamp). Paint the wood a color that will look nice with the stamp. Glue the stamp to the front of the wood. When dry, paint over the stamp with white glue to give it a shiny effect and to protect it. Attach the PVC pipe to the wood. Use a piece of dark blue felt (or another color if you desire) for the background of your wall hanging and alphabet macaroni for the lettering. Arrange the macaroni letters on a sheet of paper, spelling out the words of the Pledge of Allegiance as they will appear on your wall hanging. Spray paint the arrangement with gold paint. Then, using a strip of cardboard for a guide, glue the macaroni to the felt. You may want to add a small flag or other patriotic sticker to your wall hanging. Sew the top and bottom edge of the felt around plastic straws with gold embroidery thread. For hanging, insert a length of the thread through the top star and tie, leaving the ends to dangle like fringe. Look for two gift wrap papers, one with stars or a blue background and one with red/white stripes. Or just choose two patriotic gift wraps, Or make your own – use a dark blue background and add adhesive stars, then use markers to create a striped paper. Use a lightweight paper, such as copy paper, as you will be gluing the two papers together, wrong sides together – use a paper glue stick so it won’t wrinkle. Now cut a square at least 8” in size. Fold the square from one corner to the other, forming a triangle – do this on both sides, so you have four lines meeting in the center. Now make a cut about 2/3 of the way from each corner to the center. Now bring each point down to the center to form a pinwheel – don’t fold it. You can now attach your pinwheel with a push pin to a pencil on the eraser end, or use a paper brad and attach it to a balloon straw. (Using the brad, you may want to pre-punch a hole in each corner before forming the pinwheel) Now, find a breeze, or make your own! Use red tape and foil stars to decorate a roll of Lifesavers to look like a firecracker. Use a pipe cleaner for the wick, and attach a star to the end. You can use the same idea with a toilet paper roll or a paper towel tube to make much larger firecrackers. Go to http://tammyyee.com/c-shuttle1.html print out the printed sheet, (enlarge to 200%)cut out and slit as directed. Fold and glue – an easy craft that will really fly! Go to http://www.dltk-kids.com/usa/index.html for directions to make this door hanger, plus some other simple Patriotic crafts. Directions: Paint the wooden base and pre-drill a hole for the screw in the center. Screw the pre-drilled dowel into the base from the bottom. Cut a piece of leather into a 1” round and screw or tack it onto the top of the dowel. Decorate the PVC pipe with tape strips, stars, flag stickers, etc. Using the cork for the top of the rocket, thread string through the cork, knot the end, and tape the other end to the PVC pipe. (Leave 6-7 inches of string to “catch” the cork as it pops off the end) Pull up the pipe and push it down and the cork will pop off, creating a “rocket effect.” For a more colorful explosion, pour metallic confetti into the pipe beforehand. This is a great way to use up old used-up glue sticks. Remove the lid from an dried up or used up glue stick. Make a cone out of card stock by cutting a small circle, removing a small wedge, then folding the partial circle together into a cone shape. Glue gun to the top of the glue stick. Spray or paint the entire thing silver and let dry. Then decorate with red, white and blue stickers or star trims. The rocket tail is made by encasing metallic streamers or pipe cleaners in a piece of fun foam and glue gunning it to the bottom of the glue stick. Just add either a piece of PVC pipe or a pipe cleaner to make the tie slide hold your neckerchief. Cut red, white and blue crepe paper into 4-6 inch lengths. Take two of each color and stack. . Fold the stack in half and tape it to the end of a thin dowel. Decorate the streamers with star stickers. Use it for applause time at the Pack meeting or to cheer on a parade. Slip sheets of newspaper inside the shirt so paint won’t bleed through to the other side. Trace several star shapes on the corrugated cardboard and then cut out with scissors or a craft knife. Peel away the top layer of the star to expose the ribbed layer of the cardboard. Then press firmly and evenly against the shirt. You will have red or blue stripes with stars showing through. Let the paint dry completely, then heat set with a hot iron – but use a piece of fabric between the painted fabric and the iron. Every state has a flag and a seal – you can find that information on the web sites. Sometimes they are very complicated, with lots of symbolic figures and landscapes in them – and today, we would usually just photocopy them. But artists have for hundreds of years used a technique called “cartooning.” It’s not the same as the Sunday funnies! Take the original picture (it can be any size). Now you want to create a grid of squares large enough to cover the original – if you don’t want to damage the original, draw a grid of squares large enough to cover the original. If you can draw the grid on a piece of see-through plastic, that would be great. Then you can just put the grid over your original, and still see the picture underneath. Now, start from one side of your original - look just at one square at a time – don’t worry about the whole picture. Starting from the same square on your paper, copy the line you see ONLY IN THAT SQUARE, on the original. Look carefully, and see how far down in the square the line begins. Is it a straight line? Does it curve? Is the curve toward one side? Remember, ignore the big picture! Just focus on one square at a time and draw only the lines you see in that square – and make sure you are copying the lines in the same square that you are looking at on the original! Continue moving from square to square.